Map of Oceania and Malaysia. 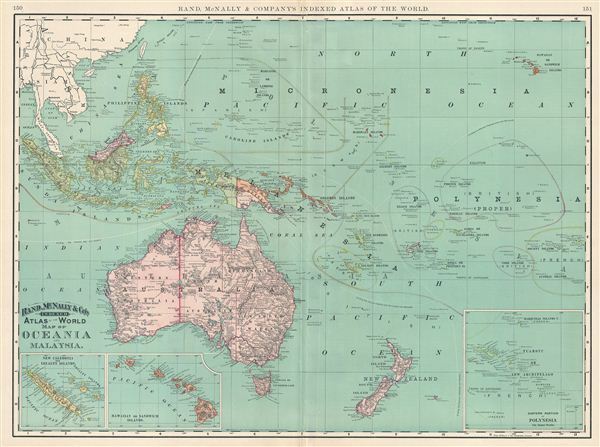 This is a beautiful example of Rand McNally and Company's 1892 map of Oceania and Malaysia. It covers the Malay Archipelago, Micronesia, Melanesia, Polynesia and Australasia. Three insets along the lower border detail the New Caledonia and Loyalty Islands, the Hawaiian or Sandwich Islands, and the eastern portions of Polynesia. The Malay Archipelago (or east Indies) is here referred to as Malaysia, not to be confused with the modern day country of Malaysia on the Malay Peninsula, which is not part of this map. Singapore, at the southern top of Malay, is however noted as a British territory. Papua New Guinea is divided into two regions, the northern part of which is named Kaiser-Wilhelmsland, which was at the time (from 1884 to 1918) part of the German empire. Throughout the map identifies various British, Dutch and French territories. Australia, divided into its five provinces of Western Australia, South Australia, Queensland, New South Wales, and Victoria is prominent. The map is highly detailed and color coded according to territories and regions. Several cities, towns, rivers, islands, deserts, mountains and various other topographical features are noted with relief shown by hachure. This map was issued as plate nos. 150 and 151 in the 1895 issue of Rand McNally and Company's Indexed Atlas of the World - possibly the finest atlas Rand McNally ever issued. Rumsey 3565.040 (1897 edition). Philip (atlases) 1026 (1898 edition).